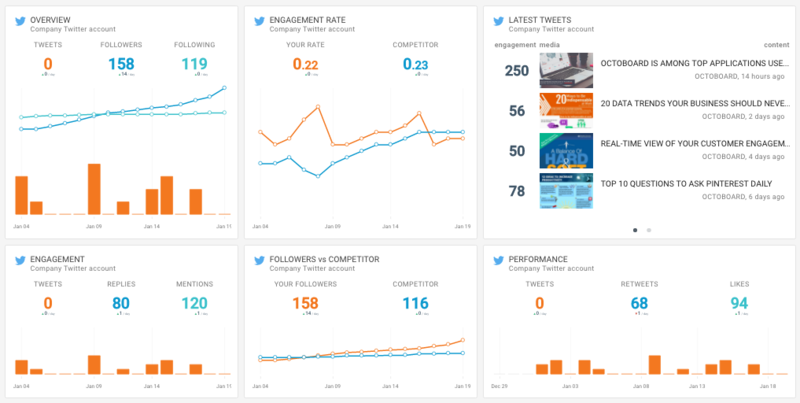 Complexity of KPIs and metrics in a Twitter social media dashboard can be overwhelming. Metrics are difficult to collect and sometimes very hard to understand. This is why we wrote this short document to help address this problem in a practical, less complicated way. KPIs are too complex. Look for insights instead. 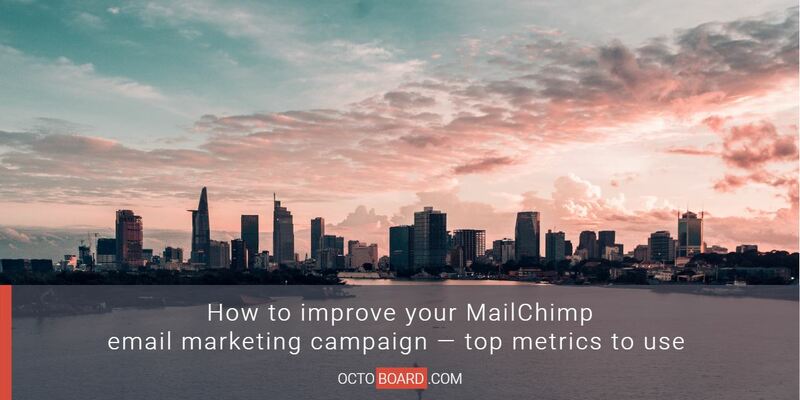 Forget about KPIs or metrics for the moment, after all, they are little more than just numbers. What you should be looking for is insights – a story that tells you something new, a new trend, new activity, and in general – something of value to you or your business. Spotting insights is not easy. Instead of learning how to create KPIs and adding them to dashboard think about questions that you want answered daily and without effort. To spot insights, think of practical questions you want to answer daily and look at metrics that are relevant. We have selected simple questions for you to get started. We also broke each question into metrics that we know are possible to retrieve (in fact, we have already retrieved them for you). If you look at metrics in the context of a practical question you will start spotting trends, and this is how you will get to insights. We have selected simple questions to get you started and match them with metrics that we know you can use without much effort. 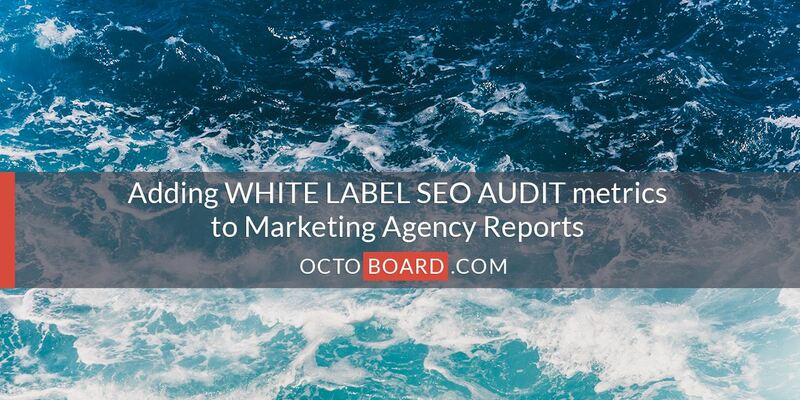 We only pick metrics that are readily available and provided to you automatically so there is no need to call IT support – you can select and look at them in a ready-made dashboard template below. Start from these simple questions first. Ask them daily (or any time with octoboard.com). Once you get comfortable, you can always ask for more and get more value from your data. QUESTION 1: Can I track my Twitter account popularity and audience feedback in real-time? OVERVIEW – Total number of followers, following and tweets per day. 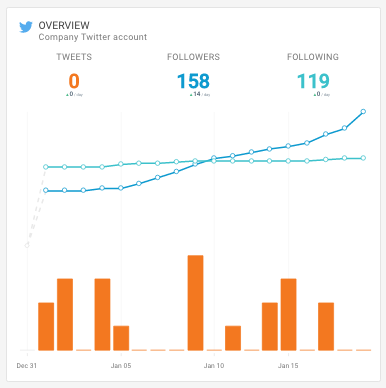 PERFORMANCE – Performance metrics over time: tweets, retweets and likes. 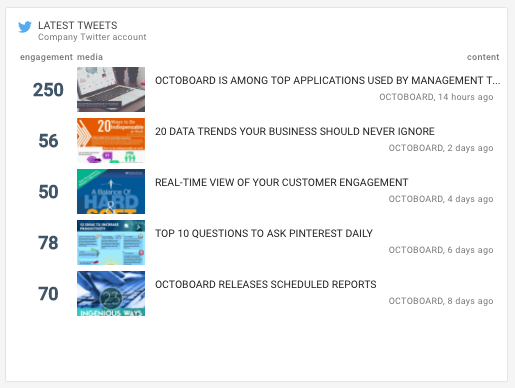 MENTIONS FEED – Your account mentions displayed in a feed table. RECENT TWEETS – Your most recent tweets ranked by Engagement. QUESTION 2: Is my Twitter activity increasing over time? 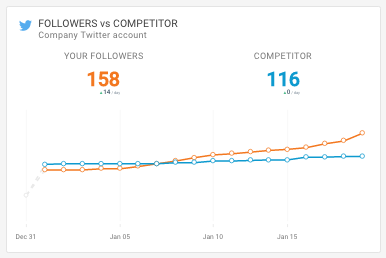 FOLLOWING – Number of people that you or your competitors follow. TWEETS – Number of tweets over a period of time. QUESTION 3: Is my Twitter account gaining popularity? Counting LIKES, FOLLOWERS, FAVORITES and trending them over time show how interesting or popular your tweets are. It could be useful to combine these metrics with Twitter ENGAGEMENT RATE tracked by Octoboard. LIKES – Number of likes received by your account or by competition. FOLLOWERS – Number of people who follow you or your competitor. LISTED – Number of times your (or competitor) account has been listed by other Twitter users. FAVORITES – Number of favorites received by your or your competitor’s content. QUESTION 4: Do my visitors like and interact (engage) with my Twitter content? 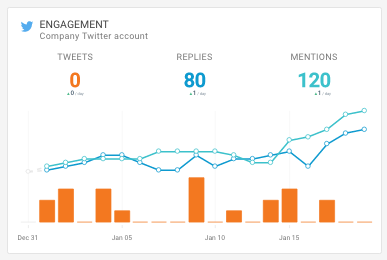 ENGAGEMENT – Your engagement metrics over time: tweets, replies and mentions. ENGAGEMENT RATE – Your Engagement Rate over time. REPLIES – Number of replies to your (or your competitor’s) tweets. RETWEETS – Number of retweets of your or your competitor’s content. MENTIONS – Number of mentions received by your account or competitor. QUESTION 5: Can I follow competitor’s activity and compare metrics to mine? Number and complexity of metrics can be overwhelming. Instead of jumping into complex stuff, start from practical questions and metrics that are easy to follow and readily available. Remember, this is your data. Get smarter now by using data your already own. 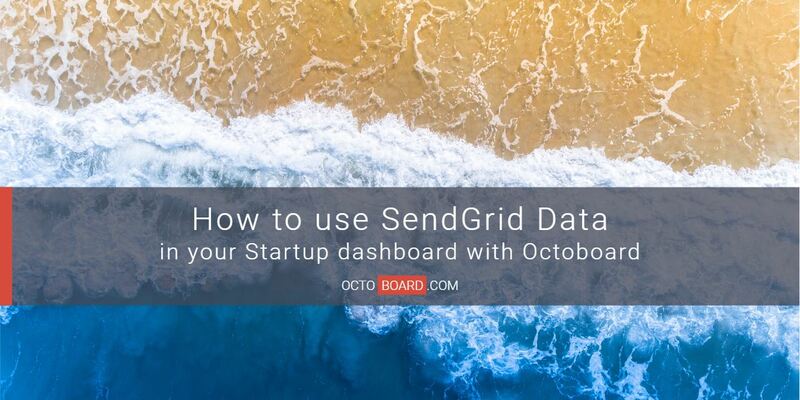 These selected metrics have been prepared for you by OCTOBOARD. Go ahead, it will take seconds to setup. No credit card required. Quiz: Are you a Digital Marketing Expert? Quiz: Do you know Google Analytics?